Also Called: Sand paspalum, thin paspalum. Culms: Ascending or spreading, few to several stems in a tuft, compressed, somewhat purplish towards base, glabrous, nodes sometimes slightly pubescent. Blades: Flat, firm, yellowish-green, 2 to 10 inches long, .2 to .6 inch wide, variably hairy to nearly glabrous, rounded at base; margins crinkly, long hairs from pimple-like bases; tips pointed. Sheaths: Flattened, throat and margins hairy. Ligules: Short membrane backed by white hairs. 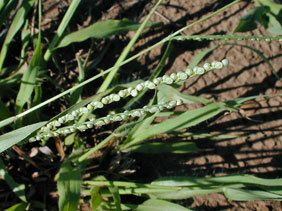 Inflorescences: Racemes, 1-3 or rarely more, 2 to 5 inches long, slender, straight or arching, terminal on stalks; axillary racemes usually solitary, often completely or partially enclosed in sheaths. Spikelets: Usually in pairs, arranged alternately in two rows on one side of flattened rachis, crowded or relatively loose, short-stalked, nearly circular, pale, glabrous or pubescent; first glume typically absent; second glume and sterile lemma about equal, both 3-nerved. Habitat: Open ground of pastures, roadsides, and open woods; sandy soils. Uses: The Kiowa considered paspalum a beneficial fodder plant. Comments: Paspalum is a variable species with two varieties.